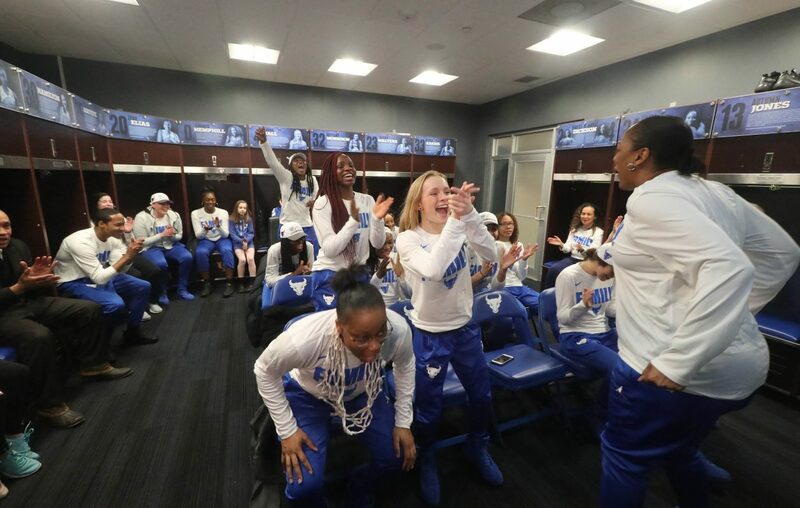 There was far less suspense than at this time a year ago, when the University at Buffalo women’s basketball team had to hope for an at-large bid into the NCAA Tournament before making its run to the Sweet 16. This time, the Bulls assured themselves a spot in the field by winning the Mid-American Conference Tournament championship, the automatic berth sending UB to the NCAA Tournament for the third time in four seasons. But a handful of questions remained. Where were the Bulls seeded? And when, where and who were they playing? The plan was for UB players and fans to gather to watch the NCAA selection show at 7 p.m. Monday night on televisions at Santora’s Pizza Pub & Grill on Transit Road in Williamsville. But the biggest surprise was how the team found out – through a group text message earlier that afternoon, after ESPN mistakenly broadcast the women’s bracket during a show dedicated to analyzing the men’s tournament. No. 10-seeded UB (23-9) will play No. 7 Rutgers (22-9) at 4:30 p.m. Friday at the University of Connecticut in Storrs, Conn. The winner will likely face perennial powerhouse and second-seeded UConn in the second round on Sunday. The Huskies take on No. 15 Towson in the first round. Rutgers' Hall of Fame coach C. Vivian Stringer, 71, has been on a health-related leave of absence since Feb. 14, and will remain away from the team for the rest of the season. Tim Eatman is serving as acting head coach of the Scarlet Knights, who advanced to the Big Ten tournament semifinals. They received an at-large bid into the NCAA Tournament, their first appearance since 2015. After the info leaked, ESPN moved the selection show up to 5 p.m.
UB players were instructed to hurry to Alumni Arena, where they gathered in the locker room to watch the show together, even though the suspense was nonexistent. Afterward, they continued to Santora’s, where they watched the selection show again and spoke to a room full of cheering fans.